This is actually turning into a pretty interesting receiver class. John Schneider admitted he wasn’t too enamoured with 2012’s group, but I wonder what he’ll make of this one? There’s a lot of range, a lot of different body types and skill sets. You would think there’d be a player or two of interest. In 2008 no receivers were taken in round one, but when Donnie Avery was selected at #33 overall it created a scramble. Ten wide outs were taken in the second round, including the easily forgettable Devin Thomas, James Hardy, Dexter Jackson and Limas Sweed. Also among the group were Jordy Nelson and DeSean Jackson. I suspect something similar will happen next April, perhaps just a little earlier. There’s unlikely to be a receiver drafted in the top ten, unless of course Brandon Coleman turns pro and puts in a star turn at the combine. I’ve been including Coleman in my mocks through sheer hope rather than expectation – because he really should go back to Rutgers for another season of college football. Even if he does turn pro, he’s still no lock for the top ten. He does have the size (6-6), speed and catching ability to generate major interest as a high pick, but he’s only a redshirt sophomore and plays to his level of experience at times. Assuming Coleman stays at Rutgers, you could be looking at the first receiver leaving the board in the 20-25 range. The teams that list a receiver among their greatest needs (Miami, St. Louis) will pick in the top ten and will probably wait until round two or use free agency. Those currently projected to pick in the middle of the first round (Cincinnati, New Orleans, Arizona) will prioritise other positions. There are exceptions, such as the New York Jets, who could make light work of this suggestion. However, value meets need best for the receivers at around the #20 overall mark as things stand. One player who could yet change things is California’s Keenan Allen. He didn’t have an amazing year for Cal, but then he was severely limited playing within a mediocre passing game. Jeff Tedford has been fired as a consequence and a player like Allen hasn’t been able to max out his potential during college. It’s easy to forget he had offers from all the big schools – including Alabama – but chose Cal to play with his quarterback brother. It’s a nice family story, but unfortunately the working relationship hasn’t paid off. Allen had just one 100+ yard receiving game this year before getting injured – against struggling Washington State. Nobody can deny Allen looks the part. He’s a prototypical big receiver at 6-3 and 210lbs. He looks fluid running routes and isn’t heavy on his feet despite a filled out frame. He looks primed to deal with the physical approach of the NFL. But is he special enough? We didn’t see many explosive plays this year, just a lot of coming back on a route to bail out the quarterback. He fits, he chips away. Allen has that rare intensity and spirit in a receiver that has certainly helped A.J. Green make a quick impact in the league. Yet he’s going to need to prove he also has athletic potential to match the size. A great combine and Allen could be a top-20 pick. If he runs a slow 4.5 – you’re talking second round. Whenever the first receiver is drafted next April, there could be a mad rush. Like 2008, I think we might see as many as ten receivers quickly leave the board. Admittedly it’s still very early in the process and difficult to make a completely accurate projection when draft order hasn’t even been decided. However, we are approaching the end of the college season and have a good idea of the talent level available. For example, teams looking for a dynamic playmaker will monitor a guy like Tavon Austin. He’s shown he does have the speed and range to warrant comparisons to Percy Harvin. On Saturday he rushed for 344 yards from 21 carries out of the pistol formation, flashing the ability to out-run the fastest Oklahoma defensive backs and break off huge gains. He’s going to be a first round pick, mainly due to his speed and range as a multi-faceted playmaker. Cordarrelle Patterson also has that home run-hitting ability and has scored touchdowns on kick and punt returns, receptions and rushes. As soon as either leaves the board, don’t be surprised if another team gets impatient about making sure they don’t miss out on the other. They could leave the board shortly after each other. Markus Wheaton and Robert Woods aren’t anywhere near as ‘flashy’ and won’t score quite as many cheap points, but both should leave the board no later than the early second round. They have enough speed to create separation, but may struggle against physical cornerbacks. Woods is a little sturdier and has better production at USC, but Wheaton is quicker and a more important fixture for his team. Both a superior players to A.J. Jenkins, who was drafted at the end of the first round last April. 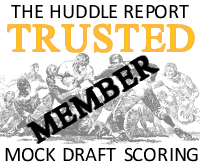 Justin Hunter could still have an impact if he declares – he’s rated by many as a potential high pick. It’s hard not to appreciate his controlled routes and likeness to A.J. Green physically, but the truth is he’s had a poor year with bad drops and not enough explosion after recovering from a bad knee injury. I’ve never been truly sold on Terrance Williams at Baylor – he looks like a product of his environment without stand out physical tools. Da’Rick Rogers remains an interesting case after being kicked out of Tennessee and being forced to play at Tenn. Tech. Keep an eye on DeAndre Hopkins who could go much earlier than most people expect, while Coby Hamilton has enjoyed some big performance for Arkansas and certainly looks the part even if he lacks consistency. Of course, if you want a player who can make 1-2 huge plays in a game and can be used in many different ways, you’d push Patterson and Austin nearer to the top. And if Keenan Allen runs a 4.4, you become a little bit more excited about his potential. So there’s still a lot to be decided between now and April. But you knew that already. I included Markus Wheaton at #33 on the updated top 50 watch list yesterday, a sign of how keen I am to see him in Oregon State’s final couple of games. He’s not the biggest receiver at 6-1 and around 185lbs, but he’s up there with DeAndre Hopkins as one of the more under rated receivers eligible for the 2013 draft. For the season he has 68 catches for 977 yards, including ten touchdowns. Wheaton’s a senior and put up similar numbers last year (73 catches, 986 yards) but he’s become a much greater scoring threat, having only made one touchdown in 2011. He’s a consistent option who might not make too many big, explosive plays – but he has got the deep speed and he’s a consistent hands catcher. I’ve watched Wheaton a few times now and there are a few things that keep cropping up. Firstly, he’s a very willing blocker in the second level. He anticipates the running back finding the hole and will look to make blocks downfield to enhance a gain. Secondly, he does a fine job creating separation. Time and time again he’ll create space with a crisp route or a double move. He’s one of the smoothest route runners you’ll see in college, no doubt down to the fact he’s a senior and has had the time to work on his game. He could end up being a surprise late first rounder like A.J. Jenkins and anyone who drafts him in round two is getting a bargain. I’m not sure what the Seahawks are looking for if they want to add another receiver, and it may be that they want that big bodied target who can be physical while still getting downfield. I’m getting to the point where I’d consider Wheaton in round one even if he doesn’t have elite size. You know what you’ll get with this guy. He might never be Calvin Johnson, but who is? I’ve included tape of his performance against UCLA above, courtesy of JMPasq. A month ago we had a look at some of the players to keep an eye on as the college season progressed. As we get closer to the finish line, it’s time for one final list. Huge potential and upside as an athletic outside linebacker in the NFL. He plays inside at Georgia but will likely switch to the WILL or SAM in a 4-3 at the next level. Minor character issues will concern some teams but Ogletree can do it all – pass rush, cover and read an offense. He could move to offensive tackle and some teams will consider a Branden Albert-type switch. Cooper has elite pass protection skills and he pulls and gets to the second level better than any other guard in college. The best zone blocking lineman to enter the draft in a long time. Road grader type who specialises in run blocking. He consistently turns opponents with great technique, opening big running lanes for the Alabama tailbacks. He’s not quite as athletic as Cooper but he’ll play left guard for 10+ years and be a regular All-Pro. It’s hard to ignore some of the opponents he’s faced this year, such as the duo at LSU. 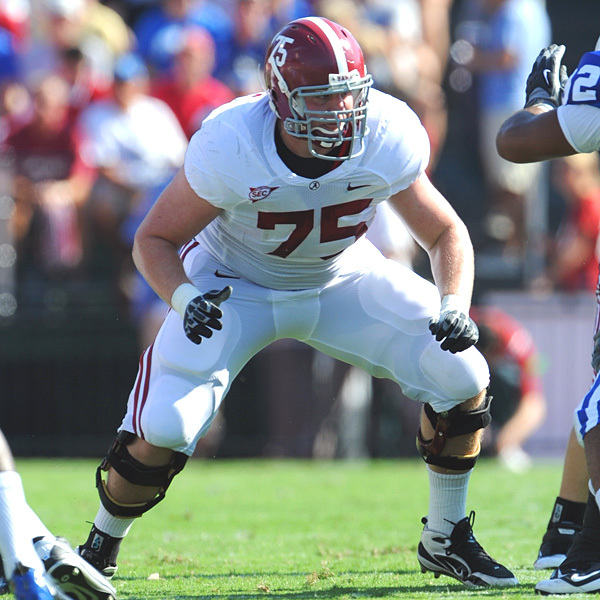 The SEC is filled with productive pass rushers, yet Joeckel and book-end Jake Matthews have looked superb. In a league where left tackles are valued second only to quarterbacks, Joeckel could be a contender to go first overall. For tape of his performance against Alabama, see the video above. Fantastic cornerback prospect who does it all. Milliner is physical enough to play up at the line and he’s terrific in run support. You need to have recovery speed, deep speed and an eye for the ball to be a top-level corner in the NFL and Milliner has the entire package. No receiver in college football has Coleman’s level of upside. He doesn’t have the production of some other players, but he’s 6-6 and 220lbs with the speed to get downfield. He’s also a pure hands catcher who can be more consistent, but he’ll get there. If he declares he’ll be an early pick. Moore has 12.5 sacks this year to lead the NCAA. This isn’t just a one-off great year either, he’s had a major impact in pretty much every win for Texas A&M. He’s capable of playing in any scheme and should be a top-five pick in April. Notre Dame doesn’t have a lot of star players, but they have a great team capable of grinding out wins. Te’o has played such an integral part as the emotional leader of the group. It’s easy to forget he has six interceptions this year. This has been a bitterly disappointing season for USC and Barkley. However, he still ranks as the best quarterback eligible for 2013. A team like Kansas City – which has a lot of weapons on offense and a not terrible line – could really use a quarterback who specialises in control, accuracy and production. A recent team-imposed suspension is a concern as Richardson is an intense character who might turn off some GM’s and coaches. Even so, he’s such a dynamic player. 100% effort on every down, he never gives up on a play. Ideal three-technique. Playmaking safety with the build and speed to be a perennial All-Pro. Not enough people are talking about Elam this season and what he’s done for the Gators. In a year where the safety class is pretty thin, expect Elam to make a big move up the boards if he turns pro. You’ll struggle to find a better run blocking tight end in college. He showed against Oregon he can lead an offense as a receiver too, making over 100+ yards and scoring a key touchdown with 90 seconds to go. A lack of top-end receivers will put the focus on Ertz, making him a likely top-15 pick. Will the speed translate to the next level? 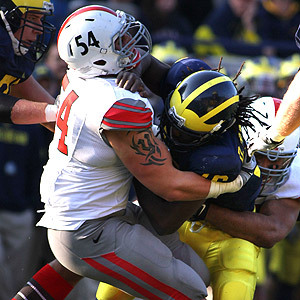 At 6-5 and 240lbs, he’ll need to prove at the combine he’s more Von Miller than Aaron Maybin. He’s had a good year despite only getting four sacks, but I think he needs to feature in the 3-4. Nobody can deny how special this guy looks when he’s at his best. On any given snap, he can destroy a lineman to break into the backfield to make a splash play. Unfortunately, he’s just as capable of being dominated himself. Teams will love his upside, but not his inconsistency. He’s looked like a proper defensive end this year. At 6-7 and 240lbs, he’s a good combine away from making a giant leap up the draft boards. Any team running a 3-4 scheme and needing a pass rusher who can drop into coverage will show a lot of interest here. Another athletic defensive lineman who could line up outside on standard downs and inside for passing situations. Ansah only has four sacks for the season but he’s looked better on tape. Like Jordan he’ll benefit from a strong combine. He lost a lot of weight during the summer to try and max out his ability as a speed rusher, but I think he played better with the weight last year. Twelve months ago he looked like a J.J. Watt clone. That’s how much potential he has. Impressive three-technique with the size to play every down. Williams flashes a great swim move and the ability to consistently make plays in the backfield. He’s played most of the year with a bad ankle, making his production even more impressive. He’ll turn 25 as a rookie next year and had some work ethic issues in high school and the JUCO ranks. One of the more impressive individual performances you’ll see this year came when Thomas met South Carolina and Jadeveon Clowney. He flashed exactly why he could move back to tackle at the next level, showing great athleticism and power at the point of attack. He’s not a flashy player, but he just finds a way to have an impact. Blue collar pass rusher who had four sacks against Wisconsin on Saturday. Every week Mosley makes a big play. It could be an interception, a sack or just a jarring tone-setting tackle. He could line up at inside or outside linebacker and might be a top-20 pick. It could be time to start considering Austin as a Percy Harvin type after all. On Saturday he rushed for 300+ yards against Oklahoma – from the tailback position. Austin has elite speed and the ability to score any time he gets the ball in space. Very strong at the point of attack and looks comfortable at nose tackle. Williams could play the one, three or five technique. He also has the ability to develop into more of a pass rushing threat. You sense there’s more to come from this guy the more he plays the game. Australian born and still learning. He’d be higher if it wasn’t for the fact he’s playing right tackle. Ideally you want to see him protect the blind side, but he’s done a good enough job against some top pass rushers to warrant a first round grade. 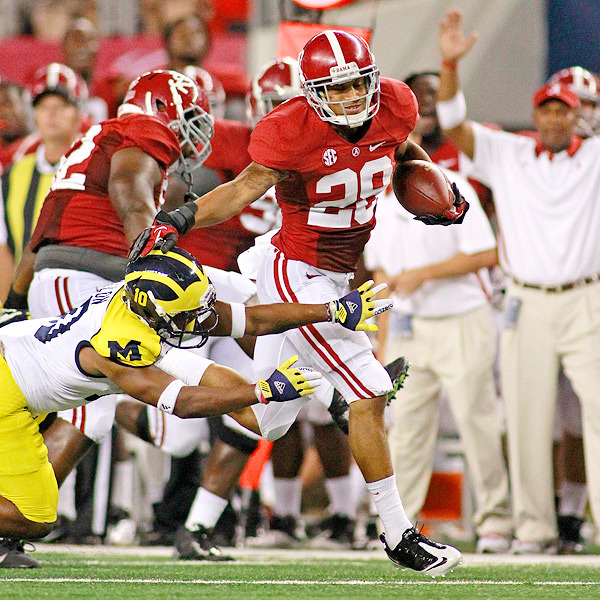 For tape of his performance against Alabama, see the video at the top of this piece. Explosive, amazing, stunning athlete. Yet being diagnosed with spinal stenosis is a concern and has to come into consideration. Some teams will strike him off the board completely. He might only play for 4-5 years. He needs to land on a team that spreads the field out and uses a lot of 4WR sets. In Green Bay or New Orleans, he’ll be a terror running across the field. You can’t expect him to be a true #1, but he’ll excel in an air-raid attack. Sturdy linebacker who plays with intensity and great range. He’ll go sideline-to-sideline effortlessly. He isn’t asked to do much pass rushing which is a slight knock, and his decision to quit Miami and return home makes you wonder if he’s adaptable. I’ve only seen one game, but he’s an intriguing guy. Hasn’t played a lot of top-level opponents but ticks all the boxes as a potential blind side blocker. He could be a late first round pick, just like another former Central Michigan lineman – Joe Staley. Nobody can argue this guy is a consistent receiver who will make a lot of solid catches. He’s a pure home run hitter, who will frustrate as much as he excites. Patterson is explosive though and will put cheap points on the board as a runner, receiver and kick returner. Nose tackle prospect with massive size (340lbs+) and great mobility. If you’re a 3-4 team looking for a cornerstone, this is your guy. He’s a better overall prospect than Dontari Poe who went #11 overall last April. He has a lot of the characteristics you look for in a franchise quarterback – decent technique, leader, arm strength. Unfortunately he also struggles to go through his progressions, forces passes and can be streaky. Just a solid, no-nonsense lineman in the mould of another former Wolverine Jake Long. He’s not close to the stature of Long, but teams needing a left or right tackle will look at Lewan in the first or second round. I like everything about this player. Wheaton isn’t the biggest receiver at 6-1, but he is tough to stop and is making a lot of plays for Oregon State this year. Off the field he’s a modest individual and that will appeal to teams trying to avoid the latest diva prospect at receiver. Started the season on fire but has regressed a little. He’s still a big, physical corner and that’s what the league is looking for right now. Roby’s having a good year and he’s made some big plays. Teams have started to avoid him. He had a tremendous day against Nebraska with two big interceptions including a pick-six. Williams could easily end up in round one. He called out the Georgia defense during a slump and it seems to have done the trick. Another good player on a talented Georgia team that could make the BCS Championship game. He’s had some sloppy drops recently and he needs to be more consistent. At 6-8 you expect Toilolo to be dominant in the red zone, but Stanford are looking for Zach Ertz more than Toilolo. He’s still a bit raw and learning – Jonathan Cooper is constantly instructing him what to do pre-snap. But it’s hard to ignore his athletic skill-set and potential to protect the blind side. He’s not quite as impressive as Barkevious Mingo off the edge and I’m not convinced he can switch to linebacker. He could be a top-15 pick if he wants to be. It’s that flash of brilliance you see every now and again which makes you wonder why he’s so underwhelming the rest of the time. This has been a chaotic year for the Razorbacks and Wilson has suffered as a consequence. He doesn’t have an ideal throwing motion and he’s made a lot of basic errors this year – but he’s a gun slinger with surprising athleticism. Everyone’s looking for the next Jimmy Graham and it could be this guy. He’s 6-6 and a pure pass-catcher who will create problems for linebackers in coverage. Don’t expect him to do much run blocking. Another player who has flattered to deceive at times this year. Like Hankins, he has the potential to be so much more. He can be brilliant. So why is there so much mediocre tape? I’ve never once watched Allen and thought, “Wow… this guy is going to be great in the NFL.” It’s OK having the size and the pedigree (he was a top recruit and almost went to Alabama). I get that his quarterback situation isn’t ideal (although he chose Cal to play with that QB – his brother). The combine will be huge for Allen and he has to prove he has the upside a lot of people claim he possesses. Without Russell Wilson keeping the offense honest, he’s had some tough games. Even so, a smart team will draft Montee Ball and get a few years of hard running and production. His effort at the second level could be better, but that’s a trait we’ve seen a lot with Virginia lineman over the years. In a man-blocking scheme he could be a useful tackle. He’s not looked completely comfortable this year. Whether he’ll ever be 100% again after a serious knee injury remains to be seen. I wouldn’t hang my hat on this guy as a #1 at the next level. For the first time at the weekend I appreciated the size concerns some people have with Bernard. He’s a good running back, but is he going to carry a heavy work load? I’m not convinced. Solid inside linebacker prospect. Hits hard and gets around the field. Doesn’t have great size but he’s sturdy enough to stay in the middle. I just don’t see a great deal of difference between Eifert and the last two big-name Notre Dame tight ends – Carlson and Rudolph. Which is why I have him in the same range as they were drafted. He’ll likely be a solid player at the next level. Note: I wrote an article for Field Gulls this week titled, ‘Seahawks draft focus: Potential 2013 targets’. Check it out by clicking here. 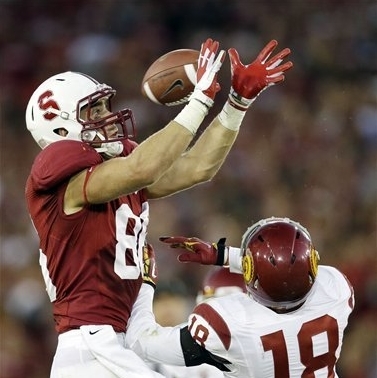 The first pass catcher off the board next year could be Stanford tight end Zach Ertz. He’s not a freak of nature like Jimmy Graham, Rob Gronkowski or Vernon Davis. But at 6-6 and around 250lbs, he’s a big target and will make plays. Ertz is a terrific run blocker and made several key plays in Stanford’s big 17-14 win over Oregon. He consistently puts his body on the line to break big gains and teams can use him for any play call. He and fellow tight end Levine Toilolo regularly lined up as Stanford’s only receivers against the Ducks, including in the games biggest play for a Cardinal touchdown with 90 seconds to go. Quarterback Kevin Hogan threw a fade to the left and Ertz made an acrobatic catch in tight coverage. Losing Andrew Luck to the NFL was an inevitable blow for Stanford, but one of the main reasons they’ve stayed competitive is due to guys like Ertz. He’s been a reliable pass catcher all year, recording 11 catches for 106 yards against the Ducks to take him to 747 yards for the year with six scores. If you’re the Miami Dolphins and looking to build around Ryan Tannehill, you have to consider this guy. There isn’t a can’t-miss receiver option early in round one, while some of the better offensive lineman might be off the board by the the time the Dolphins pick. With his ability to line up outside and as a key blocker, Ertz could be a top-15 choice next April. The race to be the #1 overall pick remains wide open. The top three 2013 eligible quarterbacks all endured further difficulties this week. 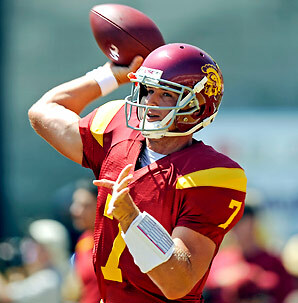 Matt Barkley picked up a shoulder injury, threw two more picks and suffered a fourth defeat of the season – this time to fierce rival UCLA. 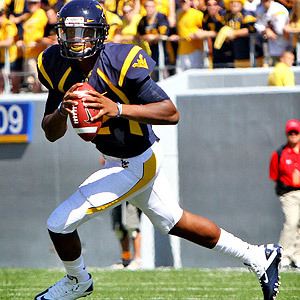 Geno Smith lost his fifth straight game against Oklahoma and also had two more interceptions. Tyler Wilson’s miserable season continued with a 45-14 beat down from Mississippi State, including… guess what? Two picks. Barkley’s swansong is quickly becoming a nightmare. One or two defeats and a solid bowl game probably would’ve justified his return for a final year, even if it was below expectations. USC entered the year as the AP’s #1 ranked team. They’re drifting towards ending the season unranked. Notre Dame visit the Trojans next week knowing a victory gets them in the BCS Championship game. Barkley might not even play due to injury and no amount of school records will make up for this disappointing season. Lane Kiffin and his coaching staff have a lot to answer for – they’ve done a terrible job this year. The consequence is Barkley throwing more picks than even his freshman season, a bad defense and a team playing completely within itself. Smith started the year on fire with five straight wins, throwing 24 touchdowns and no interceptions in the process. Since then? Five defeats, eleven touchdowns and five interceptions. He’s been streaky, showing a few concerning traits that cropped up last year too. He sometimes struggles to progress through reads, forcing passes into tight areas and trusting his arm too much. For such a mobile quarterback he’s not terribly elusive and doesn’t often extend plays. The nature of the offense at West Virginia is the same as Oklahoma State’s where Dana Holgorsen previously coached. With such a deep quarterback drop and a spread out field, Smith is essentially encouraged to throw for power rather than touch. He’s a hard working, legit NFL prospect. But is he a top pick who’s going to save a bad team? Tyler Wilson is a gun slinger who takes chances. He’s surprisingly mobile and can make plays with his feet. However, he’s made a lot of bad decisions this year. A lot of this has to be blamed on the chaotic situation at Arkansas and there’s no doubting Wilson would’ve had a tighter season with Bobby Petrino staring down his neck from the sideline. However, this is the tape scouts have to look at. He’s only around 6-1/6-2 tall and has a very slingy release point which will cause some concern. At times there’s a little Jimmy Clausen to his throwing motion, although Wilson is a much more natural passer. Like Barkley he’s thrown twice as many interceptions this year than last. Scouts will also question his decision to slam his team mates following the Alabama defeat – a game he didn’t take part in due to injury. He got a little too emotional there. With the three quarterbacks all struggling, there’s no automatic #1 pick this year. Barkley or Smith could take it if a team like Kansas City decides it needs to build around a new signal caller. The $22m guaranteed over four years is not terribly problematic and the high reward of finding a franchise quarterback makes it a worthwhile gamble. What about alternatives? Damontre Moore could go first overall – he has 12.5 sacks for Texas A&M this year and looks every bit a top NFL pass rusher who can feature in any defensive scheme. Another Texas A&M prospect – Luke Joeckel – is the best pure offensive tackle in the class and is another option to go first overall. Jarvis Jones has the talent to be the #1 pick but being diagnosed with spinal stenosis will cause some concern to NFL teams. Star Lotulelei has the upside to warrant the pick but nowhere near the consistency. Barkevious Mingo at LSU could come into contention. There’s no obvious candidate and it could filter all the way through round one. We could see a lot of early low-cost trades next April. And if a quarterback doesn’t go first overall, we could see the same again in 2014 when the likes of Jadeveon Clowney, Marqise Lee and Cyrus Kouandijo will be eligible to turn pro. It is still a quarterback league, though, so don’t be surprised if we see a guy like Barkley go first overall despite his disappointing senior year. 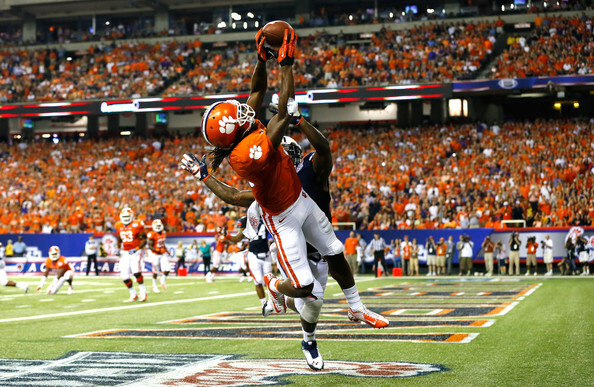 There isn’t a player in college football like Cordarrelle Patterson. On Saturday he took a punt 81 yards to the house – completing a quartet of ways to put points on the board. He now has nine total touchdowns for the year – four receiving, three rushing, one from a kick return and one from a punt return. At one point Patterson was bottled up and heading to the turf but somehow stayed on his feet, kept his balance, spun away from the tackle and managed to run it in for a score. He also led Tennessee in receiving yards (52 yards, three catches). You can see the touchdown by clicking here. He’s not the most polished receiver, but he’s a natural home run hitter who will consistently put cheap points on the board. 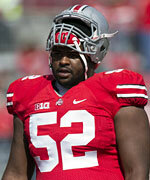 Tony Pauline speculated last week that Patterson wouldn’t declare for the 2013 draft. He also suggested quarterback Tyler Bray and fellow receiver Justin Hunter would turn pro. I think as a trio they should make a pact – all return or all declare. Tennessee fired coach Derek Dooley today, mainly because the team is 0-7 in the SEC. Learning a new system could have a detrimental impact on Patterson ahead of his final year in college, especially if he’s playing with a new untested quarterback. He might not be a ten-catch-a-game guy at the next level, but he’ll find creative ways to score touchdowns. For a team that’s good enough to justify drafting a flair player like this, Patterson will provide a dynamic weapon in the NFL. North Carolina guard Jonathan Cooper was again superb against Virginia. Any zone blocking team in the NFL will have this guy right at the top of their draft board. Cooper shows unnatural athleticism for his size and positions and flashes really quality in pass protection. He pulls and gets to the second level better than any guard you’ll see in college. In fact he’s such an athlete we could see a move to tackle, similar to Branden Albert when he was drafted by Kansas City in 2008. Cooper and Chance Warmack are 1a and 1b when it comes to the best offensive lineman in this class. Either could leave the board first, but both shouldn’t get out of the top 10-15 picks. Fellow Tar Heel Sylvester Williams deserves more attention than he gets. A lack of work ethic in high school and the JUCO ranks might put a few teams off, but nobody can deny how good he’s been for the Tar Heels. The light has switched on it seems and suddenly he looks like a dominating defensive tackle. He’s been playing with an injured ankle the last few weeks and was visibly struggling during the Virginia game. He’d got a lot of tape on the ankle and hobbled a bit after some plays. And yet he still dominated. It was a masterful performance, flashing an elite swim move to dodge blockers and break into the backfield. Williams had a big sack (you can see it by clicking here) and multiple tackles for a loss. Like Bruce Irvin he’ll turn 25 during his rookie season, but he has to be an option for the Seahawks as a possible every down three technique. Brandon Coleman had a 41 yard reception for Rutgers against Cincinnati, in a squalid 10-3 victory. You can see the play by clicking here. It’s still presumed Coleman will be returning to Rutgers next year. He’s only a redshirt sophomore with 53 career catches. Yet in a draft without a receiver likely to go in the top fifteen picks, Coleman’s massive 6-6 frame and #1 potential could tempt him into turning pro. He finished with two catches for 49 yards against Cincy and has eight touchdowns on the year. One final note – keep an eye on receiver Markus Wheaton at Oregon State. Teams will like his personality and attitude, plus his production this year has been excellent. He has ten touchdowns and 977 yards and could be a second round pick. He lacks elite size or speed and is listed at 6-1, 182lbs. However, a smart team with a good passing game will draft Wheaton and he’ll be a productive player. Not flashy, just productive. Let us know what you’re watching today. 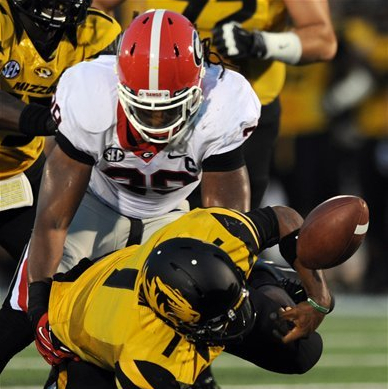 How will spinal stenosis impact Jarvis Jones’ draft stock? 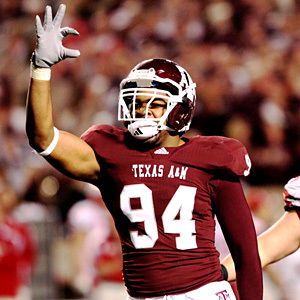 Jarvis Jones could be a top five pick. Injury concerns could also force him down the board. Jarvis Jones is an incredible football player. In two years at Georgia he’s amassed 24 sacks, flashing elite skills as a pass rusher and athletic qualities worthy of a top five pick. Yet something lingers in the background. Something that could really hamper his ambitions of playing in the NFL. Spinal stenosis is a pretty serious condition which affects a number of football players, including Jones. It’s defined as an abnormal narrowing of the spinal canal that may occur in any of the regions of the spine. The narrowing causes a restriction to the spinal canal, resulting in a neurological deficit. Symptoms can include pain, numbness, paraesthesia and loss of motor control. – Cooper Manning – older brother of Peyton and Eli – was diagnosed with the condition in 1992. It ended his career. Archie Manning had both other brothers tested immediately afterwards due to the severity of the issue. Neither had the condition. – Michael Irvin retired in 1999 after receiving advice from doctors. He was diagnosed with spinal stenosis after suffering a non-life-threatening spinal injury in a game against the Philadelphia Eagles. The injury cut short a Hall of Fame career. – Marcus McNeill was diagnosed with the condition prior to the 2006 NFL draft and it forced his fall into round two. One of the most talented offensive lineman to enter the league in recent memory was the seventh tackle to leave the board that year. At the age of just 28 he has been forced to retire, despite signing a six-year, $49 million with the Chargers after an impressive start to his pro career. – Chris Samuels was the #3 overall pick in 2000, having built a reputation blocking for Shaun Alexander at Alabama. He spent nine years with the Washington Redskins before retiring aged 32. The reason? Samuels suffered temporary upper-body paralysis after a big hit in pass protection against the Carolina Panthers in 2009. The issue was blamed on spinal stenosis, a condition he was diagnosed with as a child. He was advised to cease playing immediately. – Speculation suggested Rob Gronkowski had spinal stenosis after a series of back problems during his college career in Arizona. Agent Drew Rosenhaus was forced to deny the reports from NFLDraftScout.com prior to the 2010 draft. There were fears the talk could further push Gronkowski’s stock down the board, with lingering concerns over his back already leading to a second round fall. In 2009, Jarvis Jones was playing for the USC Trojans against Oregon. He suffered a pretty routine hit, but Jones stayed on the turf with a neck injury and was pulled out of the game as a precaution. Doctors diagnosed a mild case of spinal stenosis. On the injury: “It seemed like just a regular linebacker injury, I don’t think any of us thought it’d be as serious as it turned out” notes Norton Jr. It was his last act for USC’s football programme. Not surprisingly for a young man with so much talent and ambition, he didn’t take no for an answer. While USC were unwilling to clear him to play, other teams might be willing. Georgia coach Mark Richt forced Jones into a series of tests and examinations and the doctors cleared him to play for the Bulldogs. He’s since developed into a college football star in its most high profile conference. Jones may face a similar situation when he turns pro. Some teams will likely adopt the approach of USC and strike his name off the board. Given the chance to speak to Jones, they may even recommend he retires to avoid serious injury. Others will take advice from doctors and if they’re given the green light, will probably look at the big plays, 20+ sacks in two years and elite athleticism and take the chance. The question is, will one of those teams take a chance in the top ten? Or will they take the chance in round two? We’ve assumed for so long that Jones would be a high pick due to his on-field performance, but this is something we’ll have to consider seriously as we edge closer to the draft. The condition was bad enough to force Marcus McNeill into round two, but it wasn’t bad enough to stop him enjoying a productive career until the age of 28. 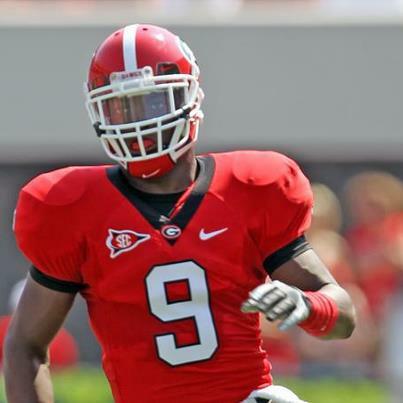 Jones actually has another year of eligibility at Georgia, but if he turns pro in 2013 he’ll be a 24-year-old rookie. Will a team roll the dice on a top-ten pick for a talented player who might only play 4-6 years in the league? All the while risking serious injury? It’s worth noting that there haven’t been any issues at Georgia and Jones hasn’t just played, he’s dominated. That creates a real dilemma for scouts and GM’s at the next level. He has the condition, however mild. Are you willing to be the team that puts the guys health at risk? Or do you listen to the doctors, see his body of work in college and go with a player of immense talent? With a clean bill of health, he probably would’ve had three years at USC and waltzed into the league as a top pick. We’d be watching him on Sunday’s right now. Unfortunately that isn’t the case. And however much we enjoy watching him play for Georgia, it doesn’t necessarily mean he’s going to be the high pick everyone expects. This condition has impacted players before and it could have an impact on Jarvis Jones come next April. The draft is a slightly different animal since the new CBA was signed. The rookie wage cap has revolutionised the NFL, making the #1 pick a worthwhile possession rather than a hindrance. Sam Bradford – the final #1 overall pick before the new rules kick in – signed a contract worth $78m with $50m in guarantees. With an updated CBA in place, Cam Newton and Andrew Luck both agreed deals worth a fully guaranteed $22m. Teams don’t need to fear a JaMarcus Russell-style titanic mistake anymore. With that in mind, there’s scope for a bad team to do whatever it takes to get a kick start. Indianapolis choosing Andrew Luck was pretty much a no-brainer. Carolina drafting Cam Newton? Not so much. The Panthers had the #1 pick but no quarterback. They could’ve gone in many different directions. 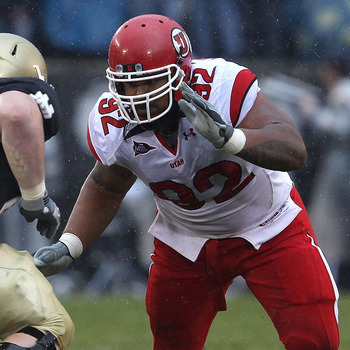 Lot’s of pundits had them taking Nick Fairley, a defensive tackle. Or Von Miller, a pass rusher. Or Patrick Peterson, a cornerback. In the end, they decided they needed a quarterback at all costs. They went through the list (four quarterbacks were taken in the first twelve picks) and chose Newton. That was point one of the rebuild. Like many teams, the Carolina Panthers were going to build around a quarterback. Which team would’ve taken Newton had Carolina gone with, for example, Von Miller? I would guess he’d still be on the board at #8 where Tennessee took Jake Locker. He may have survived beyond that. I think there are similarities between 2011 and the forthcoming draft in April. There are a handful of really talented defensive prospects. There isn’t a clear ‘superstar’ quarterback gaining rave reviews like Andrew Luck or Robert Griffin III. If the Kansas City Chiefs have the #1 pick they’ll be in the same situation as Carolina. They’ll face a choice of best player vs a launch pad quarterback. And I suspect they’ll take a quarterback. The question would become who do they take? Newton was an easier choice in 2011 due to his outstanding physical talents. Matt Barkley, Geno Smith, Tyler Wilson etc don’t boast those same qualities. Yet anyone watching the Chiefs recent defeat to Pittsburgh can identify where Kansas City’s problems lie. They don’t have a terrible roster. They’ve got some nice pieces on defense and some playmakers on offense. They compete in a pretty open AFC West division. They just need a quarterback who can bring everything together. While I accept none of the quarterbacks eligible for 2013 probably deserves to be the #1 overall pick based 0n performance this year, I think it’s stll likely to be the direction Kansas City goes if they have the choice. When we get into December I’ll start the weekly mock draft updates and we’ll run through different alternatives for the Seahawks. For now, I’m sticking with the same pick as last time. This offense continues to utilise the run as its focus and that will always be the case with Pete Carroll as Head Coach. He appears to want a big strike passing game and Darrell Bevell is becoming increasingly creative to make that happen. Across the board they like multi-faceted athletes who can contribute in a number of different ways. So the pick once again this week is Tennessee’s Cordarrelle Patterson. Receiver is considered less of a need nowadays, but the Seahawks could still use another playmaker. I did consider Arthur Brown (LB, Kansas State) – a player Carroll is familiar with. I also considered the remaining defensive tackles, Robert Woods, the two Stanford tight ends and cornerback Jonathan Banks. However, I do think they’ll look at ways to aid Wilson’s progression in year two. A receiver in Seattle might only make two passes in a game, but he’ll come away with 50-60 yards and a touchdown. That’s the big strike passing offense for you. Patterson has got the potential to be a home run hitter – to make two big plays in a game if not the 10-catch performance we’re unlikely to ever see in this system. I’ve included a round two at the bottom. Please don’t read too much into the selections there – it’s really just a review of the next tier of prospects. Watching KC’s game against Pittsburgh, it’s obvious this team needs a quarterback. They need to identify which is the best and draft them. He’s been incredible this year and leads the NCAA with 12.5 sacks. The Jaguars have no pass rush. Explosive playmaker but there are some concerns about his health following the injury that led to his departure from USC. Prototypical three technique interior pass rusher. The Panthers run a variety of 4-3 and 3-4 looks but Richardson can adapt to both. Buffalo’s GM keeps telling the media Ryan Fitzpatrick isn’t a franchise quarterback. So it’s not hard to guess what they might do here. The Raiders just need to start drafting good football player. 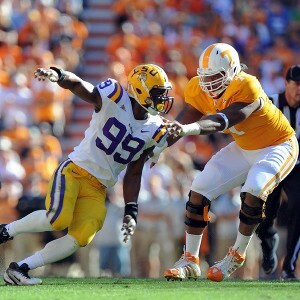 Warmack will be a top NFL guard in year one. He’s played well enough this year to move into top ten consideration. The Eagles need to sort out their offensive line. Cooper is athletic enough to play tackle or guard. If the Jets do go defense here, Mingo makes a lot of sense. They need a great edge rusher. Huge upside but he can be very inconsistent. Anyone who gets Dee Milliner outside the top ten is getting the steal of the draft. He needs to add weight again. At his 2011 size he’s a J.J. Watt clone. That’s his ceiling. If he declares (big if) he’ll be by far the most talented receiver in the 2013 draft. Ansah will test well at the combine and work his way into the top-20 picks. He could be better than team mate Luke Joeckel, but doesn’t get quite as much credit playing right tackle. Amazing athlete who’s still learning to become a rounded pass rusher. It’s the same thing every week – C.J. Mosley making big plays for Alabama. Multi-faceted playmaker who will score touchdowns in many different ways. He’s also 6-3 with electric speed. The Steelers can afford to draft a tight end here and Ertz is getting a lot of top-20 talk at the moment. If you need a guy to build a 3-4 defense around, here’s you man. He’s only still on the board due to age. Former JUCO transfer approaching his mid-20’s. Blue collar player that’ll boost Baltimore’s pass rush. Thomas was so impressive against South Carolina and Jadeveon Clowney. He could play tackle or guard. Putting a 6-8 red zone threat alongside Julio Jones and Roddy White makes sense to me. It’s a compelling argument. I’ve watched three Indianapolis games this year, a couple of Washington games and four Miami games. I can see why people get carried away with Andrew Luck – he’s close to being the perfect young quarterback. He’s athletic, he’s accurate, he has ideal size and mobility, he scores highly for character and leadership. It’s only a matter of time until Indianapolis hosts playoff games again and Luck will probably top Peyton Manning’s solitary Super Bowl victory with the Colts. Yet right now, on November 14th 2012, Russell Wilson is the better player. What’s more, I’m not convinced Luck’s ceiling is much higher than Wilson’s. The one thing holding Wilson back in the draft process was the much-talked about height issue. Here we are, ten games into the season, and it’s had virtually no impact. Once you take away the height chatter, what’s the difference between the two players? Every quality Luck has, Wilson either matches or beats. He’s athletic, he’s accurate, he has the mobility and he scores highly for character and leadership. The only thing Luck dominates is the hype factor. As Byrne writes, part of this is down to the ‘storyline’. People love to see expectations met and Luck had been expected to be great ever since he completed his sophomore season at Stanford. The Chuck Pagano angle is adding to the Hollywood nature of this script. The story will inevitably end with a Super Bowl victory against the odds – if not this year, then certainly in the future. And who would begrudge Pagano or Luck that success? Not me. Wilson hardly had any expectations as a 5-11 quarterback taken in the third round. He was the story of pre-season at a time when virtually everything else was decided. Unless he turned Seattle into a Super Bowl contender as some (Bill Simmons) projected, he was never going to truly challenge Luck and Robert Griffin III for headlines once the proper football began. It means a different story of a battle against the odds remains untold. Give Luck some credit because he’s playing without a lot of the key factors required to challenge. The Colts defense isn’t great. They don’t have a dominating ground game. This is pretty much the same roster that went 2-14 last season. For years Indianapolis relied on Peyton Manning and Peyton Manning alone. Now they might be about to rely on Andrew Luck. It’s working so far, but they’ll have to build up that roster pretty quickly. Wilson has the benefit of a franchise that spent two years rebuilding and re-tooling. He can lean on Marshawn Lynch and big investments on the offensive line, at receiver and at tight end. The Seahawks have a top-tier defense. At the same time, he’s still playing at an unusually high level for a rookie quarterback. For that, Wilson deserves some of the limelight. The crazy thing is, this year could’ve been even better for Wilson and the Seahawks. He has eight interceptions, but that includes an ‘arm punt’ against Arizona, a crazy day in St. Louis where all three picks could be blamed on other people and a juggled catch-turned-interception by Marshawn Lynch against Carolina. All quarterbacks have tough breaks so this is nothing unique or an excuse. Yet we’re talking about five interceptions out of eight. The other three were all Wilson – either a bad decision or poor execution. For the record, he’s thrown 253 passes this year. Three picks that were truly his fault and he hasn’t exactly had many near misses. He’s been the very picture of efficiency, while still flashing big plays. What attention did Wilson get for out-duelling Tom Brady with a three touchdown performance, including a fourth quarter comeback? Or for mastering a victory over Rex Ryan – a coach with a legit track record against rookie quarterbacks? The same Rex Ryan who embarrassed Andrew Luck and the Colts recently? Luck has a very mediocre game against Jacksonville – probably the worst team in the NFL – and he’s celebrated like a champion. One of Luck’s three defeats this year came against the same Jaguars outfit. I don’t think there’s any question that these two players will be compared time and time again during their careers. Perhaps more so than Luck and Griffin III. After a brilliant debut against Washington, RGIII has been mostly efficient with moments of brilliance. The big problem is the Redskins don’t have the scope to build around their prized asset. Without a first round pick until 2015, how are Washington going to repair their offensive line, improve the secondary, add playmakers and bolster the front seven? This is the type of quandary Seattle and Indianapolis don’t have to consider. Griffin III has avoided turnovers but has also made some questionable decisions – including taking avoidable hits with reckless play. He’ll have to learn to protect himself better. And while he’s clearly capable of greatness on any given play, can he show the same level of unflappable consistency we’re seeing from Luck and Wilson? Ryan Tannehill didn’t impress me much in college and I remain sceptical now he’s in Miami. He’s had some good games. He’s also shown the same kind of issues we saw at Texas A&M – bad decisions, avoidable picks, tipped passes by the dozen. After nine games he’s scored just five touchdowns. Five. That’s compared to nine interceptions. He’s struggled in the red zone and Sunday’s beat-down at home to struggling Tennessee compounded the reality check. That’s not to say he won’t grow and develop. After all, he has a worse current situation than even Griffin III. Washington at least has the patented Mike Shanahan running game. The Dolphins have Reggie ‘one week on, one week off’ Bush and nothing at receiver. However, Tannehill has got a better press than his performances warrant. He’s still showing a lot of the concerns highlighted at Texas A&M and will need to improve to justify the #8 overall pick. Brandon Weeden is the other rookie starter and like Tannehill is faced with an unfavourable situation. Mike Holmgren did his best in Cleveland and actually made some good choices along with GM Tom Heckert. They’ve also made some questionable calls. At the time, trading down for a bounty of picks to allow Atlanta to get Julio Jones seemed like a smart move. Now, I bet Browns fans would rather have Weeden throwing to Julio. Cleveland essentially had an opportunity to build an offense around Jones and fellow Crimson Tide playmaker Trent Richardson. Instead, they’ve thrown Weeden in to pass to Greg Little and the raw but talented Josh Gordon. The decision to trade away Julio Jones will go down as a classic example of a team overvaluing picks vs talent. Weeden’s already 29 and needed a fast start to warrant any level of first round investment. Unfortunately, the Browns are 2-7. While Weeden hasn’t been truly awful (he’s had his moments), he needed more than numbers to prove his worth. He needed wins. This was a ‘win now’ selection. You don’t draft a soon-to-be 30-year-old quarterback for the future. Whether it’s Weeden’s fault or not, he had to come out swinging and winning. It was probably always an impossible task and destined to fail. The Seahawks played a waiting game to get their quarterback and so far, got the best of the bunch. Whether Wilson can remain the best will be a tall order, especially given the huge potential in Luck and Griffin III. But so far, he deserves to be ranked at #1 among this quintet of quarterbacks and a serious contender for rookie of the year. He won’t win it, but he probably should. Dan Kadar at Mocking the Draft has an updated draft order following week 10 of the NFL season. The Seahawks are listed at #21 although I think they should be at #22 due to strength of schedule. New York shares the same win/loss record, but the Giants have a weaker SOS (Seattle’s .459 vs New York’s .439). Tony Pauline has some interesting nuggets of information via Draft Insider.net. He reports that Johnathan Hankins is likely to declare despite pressure from Urban Meyer to return to Ohio State. Pauline also says he’s been told Tyler Bray and Justin Hunter will both turn pro, but Cordarrelle Patterson is expected to stay at Tennessee for another year. If Bray and Hunter head for the NFL, I’m not sure what benefit Patterson will get from sticking around under a new regime. Georgia quarterback Aaron Murray is also going to turn pro, according to Pauline’s sources. Andy Bitter reports that Logan Thomas will submit paperwork to the NFL draft committee. It’s an interesting development after Thomas had previously announced his intention to return to Virginia Tech. He might get second thoughts if he gets a positive report, especially in a year without a large group of top end first round quarterbacks. He’s had a tough season for the Hokies, but has the physical tools NFL teams drool over. Are the Seahawks heading for BPA heaven? Only a few teams are truly in a position to draft the absolute best player available. After all – what if the best player is a quarterback and you already own a franchise signal caller? That’s an extreme example, but the good teams in the NFL frequently find themselves with a much wider pool of players to choose from because they don’t have glaring needs to fill. Haloti Ngata, Ben Grubbs, Joe Flacco, Michael Oher, Jimmy Smith. Only one of those players (Ngata) was a top fifteen pick. The Ravens traded down (and then back up) to take Flacco at #18. In 2010 and 2012 GM Ozzie Newsome traded out of the first round before drafting Sergio Kindle and Courtney Upshaw respectively. They’ve also been able to find key offensive contributors in round two, such as Ray Rice and Torrey Smith. As you can see, the Ravens do a good job in the draft. Out of all the picks, Flacco is the most aggressive, ‘need-filling’ selection. The Ravens had to get a quarterback in 2008 and made the necessary moves to get it done. The rest of the picks were pretty simple – they were the best players on the board regardless of need. Baltimore’s had a great defense for a generation and for the most part a pretty good offense. And without needing to constantly reach to fill glaring holes in round one, they’ve been able to re-stock using the draft. The Seahawks haven’t had that luxury for some time now and definitely not since Pete Carroll and John Schneider arrived in Seattle. In their first three drafts with the team they had to identify glaring needs, draft accordingly and build up the roster. They had no choice. In 2010 the Seahawks knew they were going to lose Walter Jones to retirement, creating a huge need at left tackle. They took Russell Okung with the 6th overall choice. 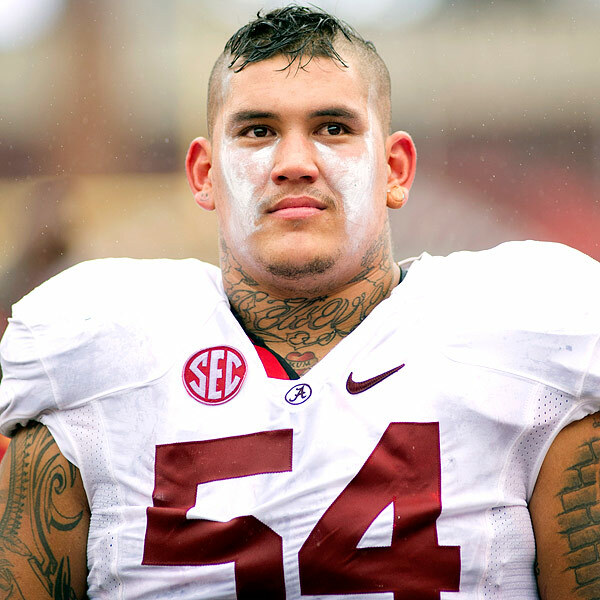 Many expected Okung to be the first tackle off the board and a top-five shoe-in (Trent Williams was drafted by Washington at #4) and clearly the Seahawks felt this was a good match of need vs talent. Even so, they were prioritising. They couldn’t afford to go into the season with Sean Locklear as their best option at tackle. They needed to use the draft to fill a need. With Okung available as a sensible option, it probably ended up being a bit of a no-brainer in the Seahawks war room. Even more so once Eric Berry was drafted at #5 by Kansas City – as free safety was clearly another target need in round one. With a second pick at #14 courtesy of Josh McDaniels, they were eventually able to fill that need. Pete Carroll made safety a priority. A big priority. You better believe he was willing to take Berry at #6 had the Chiefs passed. Although not ideal LEO candidates, both Jean-Pierre Paul and Derrick Morgan were both on the board at #14 and the Seahawks were desperate for a pass rusher after Patrick Kerney’s retirement. No dice – Carroll wanted a safety and Thomas was highly rated. This was another case where need fit with an available talent. Seattle identified two key problems they wanted to solve and drafted accordingly. One of the missions in season one was to establish a running game, but it never happened. Despite trading for Marshawn Lynch the Seahawks had possession of the #31 ranked rushing offense. It appeared to be the biggest disappointment of the 2010 season for Carroll and he made improving the ground attack a priority. Out went offensive coordinator Jeremy Bates, in came Darrell Bevell and O-line guru Tom Cable. And with Cable clearly having a big say in how they were going to right this ship, Seattle drafted two offensive lineman with their first two picks in the 2011 draft. James Carpenter was the first round choice – a major shock to many at the time. The front office clearly identified Carpenter as a worthy addition, but this was another case of the Seahawks chasing a need. Repairing the line was a huge priority, which is why John Moffitt followed in round three. Low and behold, the run game improved significantly in 2011 and attentions turned elsewhere. Despite owning a young, vibrant defense – the Seahawks just weren’t creating enough pressure. Chris Clemons made double digit sacks for the second consecutive year, but nobody else on the roster was helping out. Only ten teams had less sacks than the Seahawks. The team zoned in on the pass rushing class of the 2012 draft and were always destined to take a defensive lineman. Despite talk of Mark Barron and Luke Kuechly, this front office was always likely to draft a pass rusher in round one. As it happens, they had their pick of the group when they found themselves on the clock. And they took Bruce Irvin. For the third draft in a row, the front office identified a glaring need and addressed the issue. Something else happened in April and maybe it was a little unexpected? We now know the Seahawks managed to fill the greatest need of all during the 2012 draft – finding a young quarterback with ‘franchise’ potential. That accomplishment probably puts Carroll and Schneider ahead of schedule. I think there’s a pretty good chance they were expecting this to be a four draft plan and that they would look to use the 2013 draft to find a quarterback. I also think they would’ve been pretty aggressive in doing so. As much as John Schneider and Pete Carroll admired Russell Wilson, I’m not sure in the build up to the 2012 draft they were completely convinced they would be able to find their long term option at quarterback in round three. Schneider worked in a Green Bay front office that always drafted quarterbacks, without the absolute expectation they would become quality starters. They were essentially buying plenty of raffle tickets. In Seattle, we were seeing the same plan. And the Seahawks might have won the big prize with their first ticket. I guess the franchise was due some fortune. Had they not been able to draft Wilson – or had he not enjoyed the success we’ve seen so far – what could’ve happened? Having built up the defense and running game, they were in position to make a run at a quarterback in 2013. That’s assuming Matt Flynn didn’t step in and eliminate the need in the same way Wilson has. Instead, Wilson has shown he could be the future of the Seahawks franchise. And it means that final glaring need – the quarterback – has theoretically been addressed a year in advance. With a 6-4 record going into the bye week, Seattle is in a strong position to claim at least a wildcard spot. That would give them the #21 pick in next years draft as a worst case scenario (worst record among playoff teams + first round exit). This team is good enough to go deeper into round one, even if it’s unlikely to earn the #31 or #32 pick by reaching the Super Bowl. Either way, it seems likely it’ll be a later first round pick than 2010 and 2012. Perhaps for the first time in a while, the Seahawks will be in the ‘Baltimore Ravens’ position? Rather than needing to identify one glaring need that must be addressed at all costs, they can perhaps afford to broaden their horizons. They will still likely consider the teams greater needs – at this stage probably DT, LB and WR. But what if that excellent guard or tackle falls? 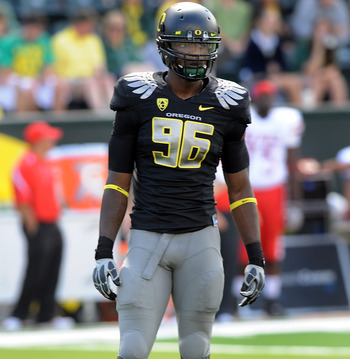 Or that pass rusher who was expected to go in the top-15? Or that cornerback that would look really good on this roster? That’s the fortunate position the Seahawks are approaching. And when you can start stocking up on talent for depth rather than feeling like you have to draft for need, that’s when you become a contender.